The recent Designs for Healthy Living Exhibition at the University of Delaware showcased research addressing a broad range of health issues. Natalie and sister Hannah model their princess dresses at the Designs for Healthy Living Exhibition. The Designs for Healthy Living Exhibition included poster displays on food safety. The Designs for Healthy Living Exhibition included mobility devices from the GoBabyGo project. 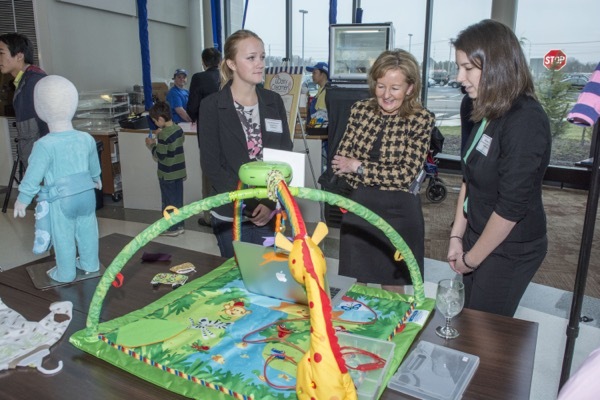 Kathy Matt (center), dean of the College of Health Sciences, learns about a project during the Designs for Healthy Living Exhibition. The Designs for Healthy Living Exhibition included a variety of activities. 12:22 p.m., April 20, 2015--Martha Hall is used to the funny looks and questions she gets when she tells people that she’s the fashion designer for the University of Delaware’s GoBabyGo program. “Everyone wants to know why a physical therapy department would need a fashion designer,” says Hall, who teaches in the Department of Fashion and Apparel Studies but is also part of a team that designs, makes prototypes and tests garment-based devices for kids with special needs. This spring, those two interests came together when Hall taught a new childrenswear course called FUNctional Fashion, which paired apparel students and kids to co-design garments that would address specific clothing-related challenges. The FUNctional Fashion Team, which runs under the GoBabyGo umbrella, is led by Michele Lobo, assistant professor of physical therapy. 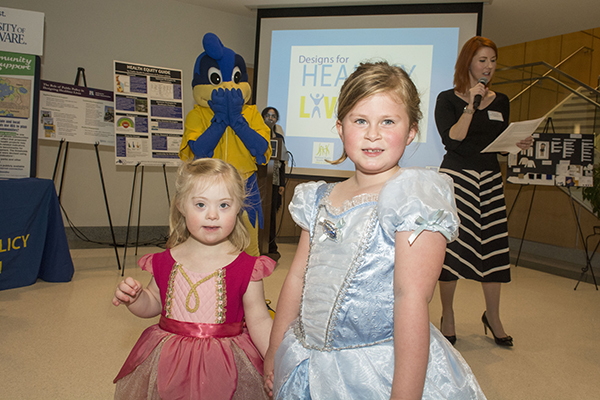 On the evening of April 10, a “red carpet” was laid out in the Health Sciences Complex atrium at UD’s Science, Technology and Advanced Research (STAR) Campus for a princess, a ninja and other young fashionistas to show off their style to attendees at the Designs for Healthy Living Exhibition. In addition to the fashion show, the exhibition featured research addressing a broad range of health issues, from human and animal health to physical and emotional health to the health of society and the planet. The exhibition was curated by Dilia Lopez-Gydosh, assistant professor of fashion and apparel studies. 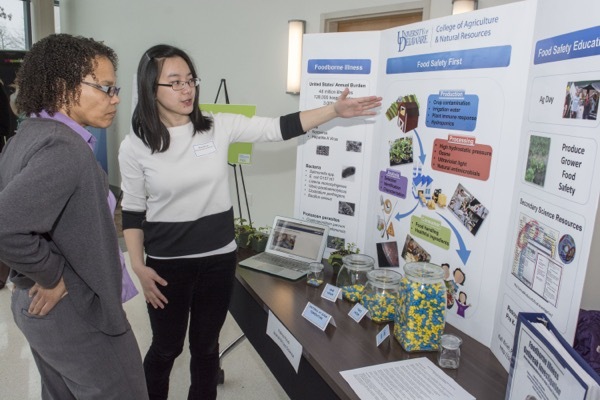 Exhibits and demonstrations from four of UD’s seven colleges highlighted a broad range of topics including zero waste fashions, devices to facilitate mobility, food safety, community health promotion and interpretive horticulture. 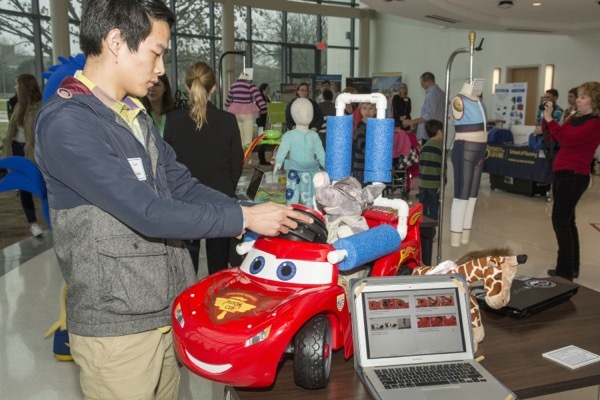 Kids played with adapted toy race cars, and families lined up at the GoBabyGo Café for complimentary ice cream from the UDairy Creamery, while representatives of UD’s Healthcare Theatre Program demonstrated devices that provide realistic training for nursing students. Senior apparel design student Dani Civil created a princess dress for 4-year-old Natalie, who has Down syndrome, in Hall’s FUNctional Fashion class. “Natalie’s older sister, Hannah, has commercial princess dresses that Natalie wanted to wear, but the fit and closures of these dresses weren’t working for her,” Hall said in announcing the young model’s walk down the runway during the fashion show. For Civil, her client’s excitement about the “pink ponte knit tea-length dress with full tulle skirt and chiffon cap sleeves” made the project very rewarding. Hall would like to teach the class again, and she also plans to continue her quest to bring together people whose paths might not otherwise cross at UD. Ashley Pigford, assistant professor of visual communications in UD’s Department of Art, came to the exhibition to engage the public with robots making art. “The idea behind this is to teach technology as a means rather than an end,” he said. That’s exactly what Hall had in mind when she launched Designs for Healthy Living.